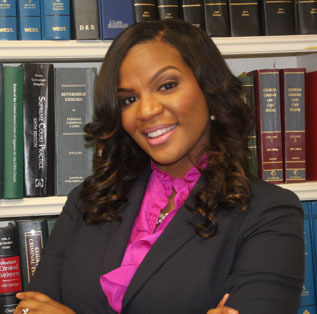 Rachel St. Fleur is the founder and managing partner of The Law Office of Rachel St. Fleur located in downtown Decatur, GA. This homegrown Georgia peach was born and raised in Decatur and is passionate about helping everyday members of her community fight for their rights. With nearly a decade of legal experience, Rachel has garnered a reputation as a hands-on attorney for your legal matter. One call to Rachel provides you with solutions on how to handle your issue. Rachel is skilled in the areas of Misdemeanor Criminal Defense, Family Law and Probate Law. Rachel provides aggressive legal representation for all of her clients. In her criminal practice she handles cases that can instantly impact the lives of everyday people ranging from minor traffic infractions to misdemeanors. Rachel’s family law practice also handles divorces, child custody, and child support matters. She also handles a critical area of law that is often overlooked–Father’s rights. Rachel has quickly developed a niche in Father’s Rights and has a successful proven track record in the courtroom, because of her determination to help her clients seek a fair and equal resolution in and out of the courtroom. Rachel also specializes in estate planning and is willing to have the difficult, yet necessary conversations surrounding estate planning. Rachel displays compassion and understanding to every client, especially those dealing with the loss of a loved one. She’s willing to provide her expertise, sympathizing with the family’s emotional needs and handles their affairs with the utmost care. Rachel has insight into the Fulton County courts system where she began her career as a staff attorney dealing with probate and estates. While serving the public for 5 years she gained a well-respected reputation for getting the job done and making client cases a priority. She also specializes in helping families with adult/minor guardianships and conservatorships. Rachel currently resides in Decatur, Georgia with her husband, James, and stepson, Justin. She graduated from the University of Georgia in 2002 with a Bachelor’s degree in Management Information Systems. She obtained her Juris Doctor from The University of Arkansas, Fayetteville in 2008 then returned back home to fulfill her passion law and help serve her community.